So after managing a large social media project that amounted to several 60-hour work weeks, the only thing I really wanted to do was sleep. But I knew if Amara and I stayed home, there would be no rest. Laundry, errands, work...something would inevitably come between me and Mr. Sandman. I had always heard wonderful things about the Hocking Hills area in Southeast Ohio, but let's be honest - I'm not the outdoorsy type. But ziplining is on my bucket list, and I'm all about any activity that allows me to keep the dog at my side. Rather than sleeping in that Sunday, Amara and I packed up for the three hour trip. It was a simpler drive that I had expected. A stop in Columbus for a visit with family (and a Graeter's ice cream run) made for a nice break too. Unfortunately our cabin reservations were lost, so we ended up in a hotel for our stay. The hotel was great, but we could not leave Trixie by herself at any point during our stay. So ziplining was no longer an option. This bummed me and Amara out. But we made due. Amara and I hiked Old Man's Cave and Ash Cave. And they did not disappoint. Everything we had heard was true...how fortunate we are here in Ohio to have such lovely state parks. The formation of the caves were intricate, and the trails led through beautiful forests. But we didn't stop there. 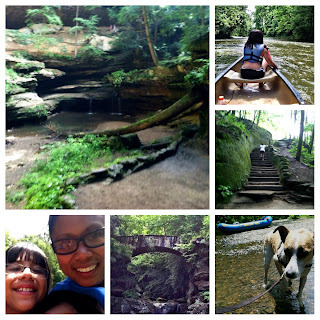 We also hit the Hocking Hills Canoe Livery. I've been canoeing once, many years ago. Amara has gone once...not with me. So I was a bit anxious getting into the river with a tween and a dog. But the staff did a great job reassuring a very nervous me that we would have a good, safe experience. And we did. The route was scenic. Amara and I were able to go at our own pace on the Hocking River. Along the five mile route, there are various islands and sandbars you can explore. Trixie literally loved getting her feet wet. So did Amara.